There is nothing more important than making sure that your kid is safe from any serious injuries while learning how to ride their bike. Aside from knee and elbow caps, the most important safety gear when riding a bike is a quality helmet. Made of PC and EPS. 11 vents for airflow, keep user cool and comfortable. For head size: 50-54 cm (19.6-21.3 inch). And although a good helmet will not stop your kid from falling when riding their bike, it most certainly helps in protecting your kid’s delicate head. However, finding a bike helmet for a toddler is extremely hard. This is because there aren’t many bike helmets which are small enough to fit your little one. And even a trip to your local bike shop will most likely leave you empty-handed. Never fret! There are bike helmets that are small enough to fit the heads of even the smallest riders out there. Here is a list of the best toddler bike helmets out there! One of Amazon’s Choice for toddler helmets, the Schwinn Classic Helmet for Toddlers, is among the best out there! It allows for enough ventilation via eight vents that are positioned on the helmet’s upper side, ensuring maximum airflow to cool down your toddlers head and bring a comfortable riding experience. This toddler helmet has inbuilt sun brims which protect it from glare and harsh outside elements for durability. Best suited for kids of the age of 3 and above, the Schwinn Toddler Classic Helmet comes in various colors and designs. This helmet is also fully equipped with a fit dial adjustment that allows customizations for the perfect fit and a chin strap for additional safety. The Giro Scamp Youth Camp Bike Helmet is one of the few toddler helmets with MIPS tech. MIPS is short for “Multi-Directional Impact system,” a tech that is incorporated in most top-of-the-line helmets to better protect the head against rotational violence. In simpler terms, it helps minimize a fall impact at sharp angles. MIPS helmet has such expensive price tag, but this one comes with a reasonable price. Another great thing about this helmet is that it can fit even the tiniest head and best suited for kids age 12 to 18 months old. It is lightweight with in-mold construction and comes with a dial adjust system for a comfortable, perfect fit. Road bike helmets are loved thanks to their generous ventilation, aerodynamic design and lightweight built. On the other hand, mountain bike helmets provide a secure, rugged fit. But this cycling helmet from Bingggooo combine the best of both worlds to create a versatile headgear for various kinds of sports. With a high-density EPS liner and polycarbonate shell, this helmet creates an in-mold construction for durability and lightweight built. It comes with ten vent holes for more cooling, and its strap system features a quick-release buckle which lets your child out easily. It also has separate pads for the chin strap to help in absorbing sweat, and its mesh pad linings make the helmet more breathable and cool. Lastly, this helmet is suitable for kids 3 to 8 years old and comes in a tactile military design with five different color choices. Designed to look like an adult mountain bike helmet, the Sidetrack Youth Helmet from Bell is a sweet-looking safety accessory which is packed with lots of safety features for a decent price tag. From its extended back coverage for better head protection to its dial-adjustable system with full cage for a more precise and secure fit, the Bell Sidetrack Youth Helmet is a toddler helmet that boasts durability, comfort, safety and just plain cool. The Bern Kids Helmet comes in two variety— Bern Nina for girls and Bern Nino for boys— with the only difference in color. The Bern helmet adopts a current Zip Mold tech which is most commonly found in adult helmets. This toddler helmet is highly versatile since it is both suitable for use in snow or the sun. The helmet comes fully equipped with a visor to protect the eyes and fleece liner and ear flaps for warmth when riding in chilly weather. Its liners sport Velcro adjustments for a perfect fit. One of the best toddler helmets available, the Giro Me2 can fit the smallest heads better than another helmet available on the market. This helmet can fit toddler heads with a diameter of 18.75 to 20.5 inches. This Toddler Bike Helmet comes with Giro’s Acu-Dial structure which is a dial system at the back of the helmet, enabling to fit your kid’s head properly. Also, it has foam pads that provide extra cushion and comfort when wearing. And even if your toddler grows, the helmet can keep thanks to its strap adjustments and foam pads. Suitable for 3-years-old kids, Giro Me2 comes with adorable designed such as goose, pink bunnies, yellow chicks, red ducks and aviator pigs, making it look appealing for your kids. This helmet comes with a total of 20 vents for the ultimate breathability and cooling. For the little ones who love iconic heroes from Marvels, this particular helmet from Bell is a great buy. Generally appealing and adorable for toddlers, this helmet highlights Marvel superheroes Spiderman, Captain America, Iron Man or The Avengers logo in different designs and look. And it is not just about the style. The Bell Marvel Superhero Helmet comes with high impact reflectors for safety and visibility, a rear coverage of helmet for extended protection and safety, seven vents for keeping your toddler’s head cool, and a self-adjusting system that ensures a perfect fit. Another great choice for quality protective headgear for your little one, this Infant helmet from Schwinn packs a lot of safety features that you will surely love. Regarding comfort, this helmet comes with 360-degree internal padding system for the utmost comfort and easy adjusting and fitting. Featuring a lower molded shell, this helmet gives extra protection from damage as well as increasing the helmet’s durability. The helmet features six air flow vents that will keep your kid’s head comfy and cool and uses a dial fit to adjust the perfect head fit. 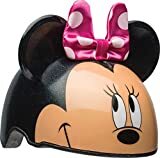 For your cute little girl who wants to ride her adorable pink bike, this Toddler Helmet from Bell features Minnie Mouse designs that attract your baby girl to wear it when cycling. Besides its attractive look, it also provides the exact fit and guarantees protection and safety, thanks to its protracted rear coverage. This helmet is compliant and meets all safety requirements from CPSC, so you are sure that you are getting a quality safe helmet for your little one. For the best sleek-looking helmet, the Joovy Noodle Toddler Helmet takes the spot. With 14 air vents, this toddler helmet allows air to circulate your kids head and ensure that their head stays cool and comfortable even on the warmest weather. You do not need to worry about bugs getting inside the holes. It has an integrated bug mesh for that purpose. This toddler helmet comes with a pinch guard chinstraps as well as nylon straps. Thanks to its simple turn dial, you can adjust the helmet easily to have the perfect fit. It also comes with an extended visor for maximum head protection and keeps the sun off you’re your kid’s face. 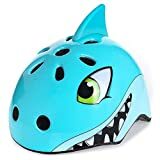 How do I measure my kid’s head for the helmet size? Just wrap a measuring tape around your toddler’s head just an inch above his eyebrows. Ensure that the tape is level all around. Take the measurement. How to get a proper helmet fit? Just follow the 2V1 guideline. Two finger width is allowed above your toddler’s eyebrows. V-shape needs to be formed under the ears by the straps. One finger width between chin straps and chin. What should I consider for the best toddler bike helmet? Style and colors are not a priority and instead, make sure that the material used in the helmet is durable. Look for vents to ensure airflow and adequate padding to provide comfort and absorb fall impacts. The best toddler helmets also come with adjustable straps and dial for the perfect head fit. Also, look for certification of meeting quality requirements and standards such as Snell, ANSI, ASTM, CPSC, and CSA. When should I replace my toddler’s helmet? It is a good idea to replace helmets after a crash. The protective foam inside is designed for single time use and if your child crashed it is no longer protected as it was. My kid does not want to wear a helmet. What should I do? Children are sometimes sensitive and do not want to wear helmets around, especially when they are around their peers. You may want to involve your kids when buying for their helmets so they can choose the design they like. Ensuring your little one gets a fun and safe ride requires than just learning a good biking skill. What you will need is the right safety gear such as a quality helmet. The best toddler bike helmet with the right fit is a sure ticket for a fun, safe and worry-free ride, everytime! My name is Julie and I'm a young mother. For past five years, I'm working at local kindergarten as a teacher of Toddler Group (children between the age of 6 months to 2 years). This job can be quite messy, you have to change diapers every day. Despite this only drawback, I love it as I love children. Using baby furniture and supplies has become a part of my life. So a few years ago while being pregnant with my son, I started looking for possible baby stuff online. However, as I discovered, it's not so easy as it seems at first sight. Therefore, I decided to help other new moms and dads with my acquired personal and professional experience. This baby blog is dedicated to all mother who is searching for the best products for their babies. We are focusing especially on the changing tables, but also on the other baby-related products.